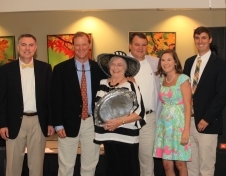 The third annual Bill Jones Legacy Award was given during the third annual Derby Night on May 3, 2014. The Bill Jones’ Legacy Award nominee was a member of the community and served on both the Memorial Hospital Foundation and Hospital Authority. Being formed about 25 years ago, the Memorial Hospital Foundation has raised almost $1 million for equipment purchases for the hospital over that time. The recipient of this year’s Bill Jones Legacy Award is Mr. Jimmy Harrell. Mr. Jimmy Harrell served as the Treasurer for the Foundation from 1991 to 1998, and as the Chairman of the Hospital Authority from 1998 through 2004. During Mr. Harrell’s tenure as the Chairman of the Hospital Authority, the Hospital experienced significant expansion with the opening of the Kirbo Women’s Center, Willow Ridge Personal Care Home, and Memorial Medical Center. We owe a great deal of gratitude to Mr. Harrell for his dedication and leadership of both the Foundation and the Hospital Authority. Mr. Jimmy Harrell is truly a legacy, and his support throughout the years is greatly appreciated and remembered. Pictured from left to right: Billy Walker, Mike Harrell, Mrs. Janet Harrell, Mark Harrell, Abby Parsons, Zach Parsons. 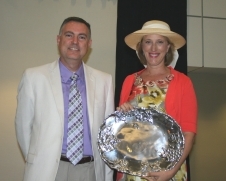 “The Memorial Hospital Foundation’s Second Annual Derby Night was another big hit for its patrons and the Foundation. We’re happy with the support from the community and glad that everyone seemed to have a great time,” said Foundation Chair Liv Warren. After expenses are paid for the April 19th event, which was held at the Bainbridge State College Kirbo Regional Center, the Foundation will use the proceeds to cover the cost of furnishings for the new Amelia Medical Plaza, which opened this week at 505 Amelia Avenue behind the hospital. Contributions to the Foundation were made through Derby ticket purchases and through silent auction and live auction items. Memorial Hospital CEO Billy Walker announced that John M. Simmons was selected as the recipient of this year’s “Bill J. Jones Legacy Award.” Simmons’ daughter, Ann Brannen, accepted the award in her father’s absence. Simmons served on the Hospital Authority of the City of Bainbridge and Decatur County, Georgia, for ten years—from April, 1988 until his resignation in June, 1998. He served as Treasurer of the Hospital Authority from April, 1988 to April, 1993, and as Chairman of the Hospital Authority from April, 1993 through June, 1998. Walker said that Simmons saw the need for a Hospital Foundation for charitable donations. He knew that Mr. Bill Jones was on the Tallahassee Memorial Hospital Foundation Board and he asked Jones to lead Memorial Hospital in establishing a Foundation. Several months after the Foundation’s first meeting, John Simmons and the Simmons family made the first donation to the Foundation to establish an endowment for future growth. When accepting the award for Simmons, Brannen said that her father truly loved Memorial Hospital and always had its best interest in mind. Hospital Authority Chairman Charles Tyson served as auctioneer for a spirited live auction. Live auction items included a one week Smoky Mountain vacation in a 5-bedroom, 3-bath house nestled in the mountains of the Green River Gorge in Saluda, North Carolina, compliments of Ken and Vicki Bailey; a gourmet roasted duck dinner for ten at Brentwood Plantation, compliments of Crave (Lori Shiver) and Brentwood Plantation (Woody and Cile Warr); a half-day quail hunt at SouthWind Plantation for 4 people, with Breakfast and Lunch, compliments of Tim and Carla Smith; a GorgeousNaga Dragon Sterling Silver and Gold bracelet by designer John Hardy set with a genuine Amethyst Gemstone, compliments of Godwin Jewelers; and a one-week Mexico Beach vacation in a 5 bedroom, 4 1/2 bath beach front home with a huge deck overlooking the Gulf of Mexico, compliments of Mike and Leslie Harrell. Almost 50 silent auction items for everything from art to antiques, portraits to parties, facials to food, and hunting trips and home décor also received generous donations to benefit the Memorial Hospital and Manor Foundation. Derby patrons enjoyed a buffet of Steamship Roast Beef, Kentucky corn pudding, ham biscuits with apple-cranberry chutney, fresh strawberries and greens salad, marinated fresh vegetables, fresh fruit and melon bowls, Bourbon pound cake and Bourbon balls, mint sweet tea and mint juleps catered by Faye Martin and the staff of Elizabeth’s. Jean Reynolds was the winner of a raffle for an IPad2, which was donated by Todd and Erica Martin and State Farm Insurance. A drawing was held at the end of the evening after everyone cashed in their chips or “funny money” for chances to win a 32” flat screen TV. Jane Conger was the lucky winner of the TV. The Memorial Hospital Foundation sponsored a Gala for twenty years, which raised over $900,000 for the Foundation to fund special equipment purchases for the hospital. The Derby Committee is already making plans to make next year’s event bigger and better. The Memorial Hospital and Manor Foundation was organized in 1989 with 14 members, as well as the Chairman of the Hospital Authority and the Chief of Staff serving as ex-officio members. The Memorial Hospital and Manor Foundation has donated over $1.3 million to the hospital for equipment purchases and other capital improvements. The Memorial Hospital and Manor Foundation will host two community-wide fundraising events this Spring. The first event is Bainbridge’s Second Annual Half-Marathon, which will bring local and regional runners, as well as walkers, to Bainbridge on March 23, 2013. The second event is “A Night at the Races,” a Kentucky Derby themed event, which will be held at the Kirbo Center at Bainbridge State College on Friday, April 19, 2013. 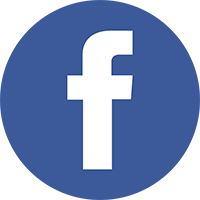 “Derby Night” will feature actual video horse races with “funny money” bidding, heavy hors d’ouerves, a silent and live auction, and a Ladies Hat Contest. Tickets for “Derby Night” are $50/person and may be purchased from Carole Clenney at Memorial Hospital and Manor. Proceeds from the Half-Marathon and Derby Night will be used to furnish Amelia Medical Plaza, a primary care physician office building. Click here for more information about the Bainbridge Half-Marathon and Derby Night. Memorial Hospital and Manor Foundation, Inc.